The C390 Door Assembly Workbenches have been designed for a new Acres client who works within the rail industry carrying out service, maintenance, repair, overhaul and upgrades to rolling stock. The door assembly workbenches are required to assist in the strip and build of train carriage doors during a reconditioning process. The trolley design will replace existing wooden tables currently used on site. The new solution will provide significant improvements over these, reducing the number of operators required to complete the job. It was important to the customer that the solution was above all both functional and cost effective. The solution has been manufactured from 50 x 50mm mild steel box section, chosen for its ideal combination of weight and strength. The trestle table design ensures the unit will accommodate the curved profile of the carriage door. Two foam pads, supplied by the customer will ensure no metal to metal contact is made. The units will be freshly painted so it is important that these foams do not mark the surface. The door assembly workbenches will feature two 200mm diameter fixed castors and two swivel castors. The floor is uneven with train tracks across the site so larger diameter wheels have been specified. These will feature black, puncture-proof lightweight, micro-cellular polyurethane tyres on welded-steel rims. Each will a max load of 75KG. Pneumatic tyres have been avoided as they deflate and brakes become inefficient. As an alternative to locking castors two truck-locks have been included to prevent the table from moving during assembly/disassembly. These are of a pressed steel construction with a zinc plated finish. Max weight of the assembled carriage door is 180KG. 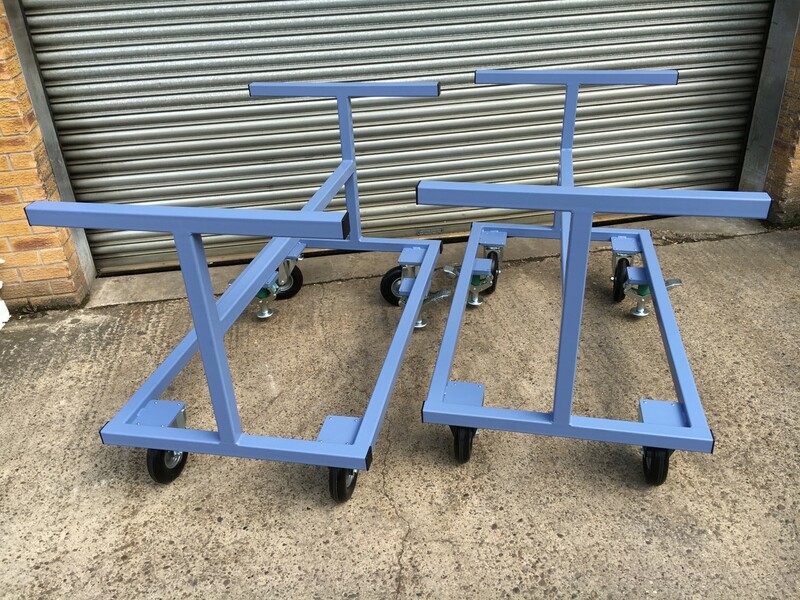 Mild Steel parts have been powder coated in Pigeon Blue to provide a hard wearing durable finish. Approximate overall size: 820mm (W) x 1480mm (L) x 980mm (H).